Don’t Want Mac & Cheese – Dalton Drop the Fees! On Wednesday, February 1st I gladly joined in with my fellow post secondary students from Ryerson, George Brown and UofTSC and marched down the streets of Toronto to Queen’s Park (Ontario’s Legislative Building). This is has been an annual rally that unfortunately has to keep happening. During my first year at Ryerson (2009) we rallied to reduce poverty in Ontario, which fell hand in hand with lowering tuition fees. When a student cannot afford the damn near impossible tuitions fees in this province (for example my program costs $25, 000 and this price goes up by the thousands every year), they are forced to take out a student loan. OSAP is an inevitable debt sentence. Beyond the debt that one has to graduate with, OSAP still doesn’t cover all school needs. I can only speak from my experience; I commute to school which means I have to buy a metro pass every month. The price on metro passes went up to $104 this year. For books I’ll say that I spend at least $200 a semester (only because my program isn’t book heavy) plus essential no less than $1,000 for equipment needed in my studies (radio and television arts – just imagine the type of equipment I invest in). When applying to work for RU Student Life the application process required me to not only outline my financial need but also apply for OSAP (which I already had to do anyways). After they assessed my financial need they found that after the amount of money that OSAP gives me every semester I still have a TWO THOUSAND DOLLARS UNMET NEED that hasn’t been met by my student loans/grants. 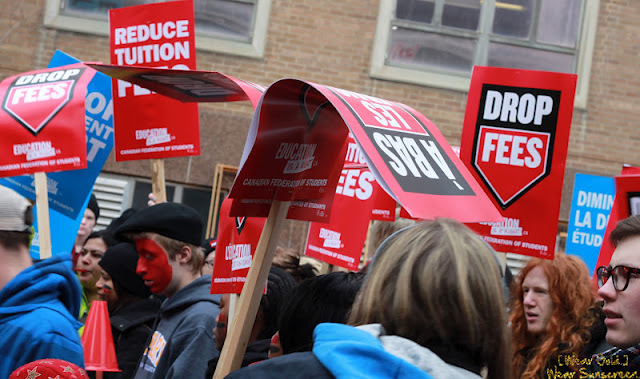 In the recent Ontario election, the liberal government promised to reduce tuition fees by 30%. Stupid us, we believed them. Turns out that a lot of us aren’t even eligible for the reduction. If you’re a part time student, been out of high school for longer than 4 years, international student and both of your parents make $165, 000 combined you are not eligible. I’m no math wiz but more than half doesn’t exactly add up to 86%. 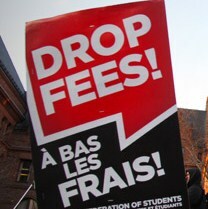 So this year we rallied to drop fees and counter the 30% reduction lies.